WARSAW, Poland -- Dozens of international historians have come to the defence of a Holocaust scholar from the University of Ottawa who is accused of slandering Poland's reputation with research that focuses on the participation of some Poles in the killing of Jews during the Second World War. The Polish League Against Defamation says that Jan Grabowski's scholarship "falsifies the history of Poland, proclaiming the thesis that Poles are complicit in the extermination of Jews." The group made its claim in a public statement earlier this month signed by dozens of Polish academics. Since then Grabowski has received several death threats, leading to security patrols in his department. The son of a Holocaust survivor, Grabowski describes the campaign against him as a "very brutal, vicious, and personal attack." Dozens of international historians of modern European history came to his defence with an open statement Monday in which they also described the campaign against him an "attack" and defended his scholarship, which they say "holds to the highest standards of academic research." Grabowski was awarded the 2014 Yad Vashem International Book Prize for Holocaust Research for his book "Hunt for the Jews: Betrayal and Murder in German-Occupied Poland," which documents the involvement of Poles in finding and killing Jews during the German occupation of Poland during the Second World War. The subject touches a raw nerve for many in Poland, who prefer to see their nation as blameless during an era when the Germans subjected the nation to atrocities and terror. During the war about 5.5 million Polish citizens were killed, three million of them Jews. Those protesting Grabowski's research have been encouraged by a nationalist government that seeks to focus exclusively on the heroic aspects of Polish behaviour at that time, including the Poles who risked their own lives to save Jews. The founder of the Polish League Against Defamation, Maciej Swirski, has also advised the Polish Foreign Ministry on its historical policies. "During World War II, due to the demoralizing circumstances and German actions, it is true that vile-acting individuals could be found among Poles and Jews alike (especially in the ghettos). Yet, we should remember that the objective of the Germans was also to 'eradicate the Polish nation' and 'completely destroy Poland,"' the group wrote. Among more than 180 scholars to sign the statement in Grabowski's defence are prominent historians based in the United States, Israel, Poland, and elsewhere. 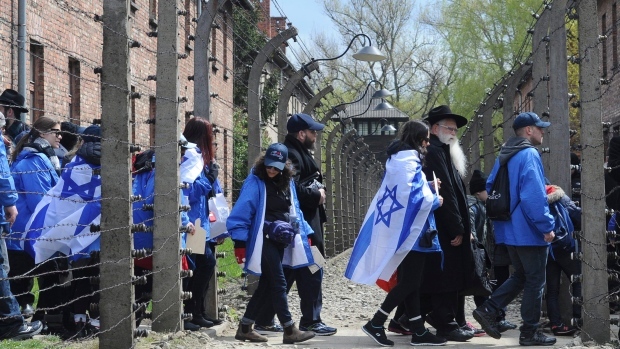 They include Yitzhak Arad, former director of Yad Vashem; Omer Bartov, at Brown University; Christopher Browning, emeritus professor at the University of North Carolina; and Deborah Lipstadt at Emory University.